In the blink of an eye, your life can get turned upside down due to the careless, irresponsible actions of another driver. A prime example is the awful accident where a Miami Beach attorney’s vehicle was clipped by another driver speeding at over 100 miles an hour on the MacArthur Causeway causing his vehicle to collide with a retaining wall. If that wasn’t bad enough, the scum bag reckless driver decided to flee the scene of the accident. The victim, a fellow officer of the court, suffered catastrophic injuries including broken ribs, a severed spine, collapsed lungs and paralysis in his legs, according to the Miami Herald. Fortunately, the reckless and callous driver that caused the accident was apprehended after he ditched his rented Nissan Armada near the criminal courthouse in Miami. He is now facing charges of leaving the scene of an accident involving serious bodily injury and reckless driving. An investigation into the accident revealed that surveillance videos caught the careless driver speeding at over 100 miles per hour in a reckless manner. His Nissan weaved through traffic, changed lanes and wound up hitting the back of the victim’s Honda Civic at about 95 miles per hour, according to the aforementioned Miami Herald article. The victim’s vehicle was propelled nearly 400 feet into a wall. The careless driver went on his way with no regards for the well-being of the driver he just hit. Under Florida law, leaving the scene of an accident is defined as the failure of a driver to remain at the site of a vehicle crash and fulfill other statutory duties when the crash involves death, bodily injury, or property damage. The reckless driver in the awful collision above committed this heinous act. 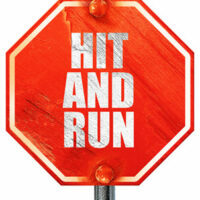 A hit-and-run involving injuries is classified as a third degree felony, with penalties of up to five years in prison and a $5,000 fine. In serious car accident injury cases where the reckless driver’s behavior was outrageous or egregious, punitive damages can be pursued along with economic and non-economic damages such as medical bills, lost wages, and pain and suffering. Punitive damages are intended to punish the reckless party and are not directly tied to the injuries of the victim. Pursuing punitive damages requires evidence of gross negligence or intentional misconduct. In most auto accident injury cases, gross negligence is the basis for seeking punitive damages. Gross negligence is conduct that is reckless and wanton constituting a conscious disregard or indifference to another person’s safety, life, or rights. For most personal injury cases, there is a limit in place for punitive damages. An injured party can only receive three times the amount of compensatory damages or $500,000 whichever is greater, according to Florida statute Title XLV section 768.73. The conduct of the reckless driver that severely injured a fellow attorney is outrageous and showed a complete disregard for the safety and well-being of the attorney, and other drivers on the road. If you or a loved one was involved in a similar accident with a reckless driver who then fled the scene, speak to the attorneys at the office of Alan Goldfarb, P.A. We are here to help. Contact our office at 305-371-3111 or toll free at 866-936-9761 to schedule a free, confidential consultation.